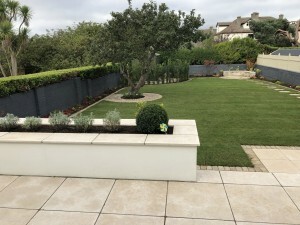 This garden design aimed to maximise the space in the centre of the garden for future children’s play space and equipment whilst at the same time softening the exterior of the garden and incorporating some nice features. The existing garden was mainly a large rectangular lawn with just a few trees and a new shed located in the corner of the garden. We aimed to soften the edges by curving the flower beds and creating a number of features within the garden based on a circle theme. in a radiating pattern of Scottish cobbles. The other existing feature within the current garden which we wanted to retain was an old granite seat . 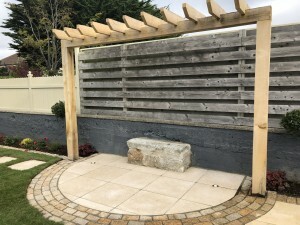 We transformed it into a lovely focal point, with a wooden chunky Pergola overhanging the existing seat and the creation of two semi-circles of stone around the seat, the inner circle finished in Egyptian limestone and the outer circle in complementary granite cobbles. A third circular feature was created at the end of the garden where a circular patio with a difference was created . 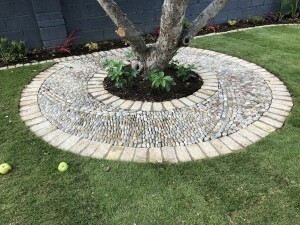 The patio was cut in a radial pattern from Egyptian limestone and mixed with two rings of oatmeal granite cobbles to give it an overall softer appearance. This patio was then backed up by a low semi-circular wall made from granite to match the granite seat nearest the house. A new lawn starts off nearest the patio adjacent to the house and becomes softer nearer the end of the garden where it curves around the new circular patio and existing shed. 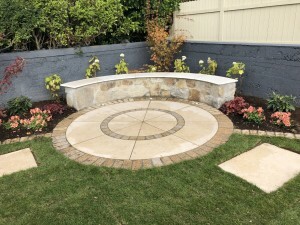 The paving material used in the existing patio was Egyptian limestone and we used this to link the patio to the new semi circles of stone around the existing granite seat and then to lead down to the end of the garden to the new circular patio via a set of random stepping-stones. We also use the complementary granite cobble to edge the lawn to help with overall maintenance. the design contains some lovely feature trees, including Japanese Maples and a selection of shrubs and perennials incorporating a good percentage of evergreen species to ensure that the garden is attractive in the winter. The planting uses some lovely maroon / reddish tones both within the foliage colour and in the flowers to match the decor in the main living areas of the house looking out over the garden.